Home / 3D / Columbia Pictures / Harry Styles / Liam Payne / Louis Tomlinson / Niall Horan / One Direction / One Direction: This Is Us / Sony Pictures / TriStar Pictures / Zayn Malik / "One Direction: This Is Us" London Premiere Streams Live August 21! "One Direction: This Is Us" London Premiere Streams Live August 21! The London World Premiere of TriStar Pictures' “One Direction: This Is Us” takes place on Wednesday, August 21 and will be streamed live over at Yahoo! starting at 12:30 a.m. Philippine time, enabling local fans to watch the event in real time. 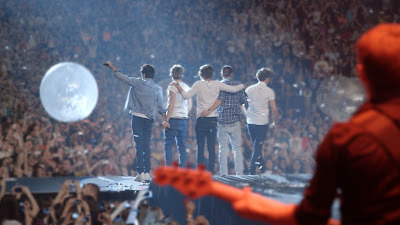 Bandmembers Niall Horan, Zayn Malik, Liam Payne, Harry Styles and Louis Tomlinson are all confirmed to attend the London premiere of the 3D documentary. More than just a filmed concert and tour documentary, “One Direction: This Is Us” is a chance to get up close and personal with the world’s biggest band. Filmed while the guys were taking their world tour to arenas around the globe -- from Mexico to Japan to London’s famed O2 arena -- the movie mixes high-energy performance footage, candid interviews, and behind the scenes footage to offer a one-of-a-kind perspective into the talent, hard work and mischief that goes into being One Direction. It’s a remarkable story of humble origins, an unprecedented rise to fame and a fan-driven phenomenon that enabled One Direction to conquer the world. Meanwhile, One Direction's "Best Song Ever" (from "One Direction: This Is Us") has debuted in the Top 10 on iTunes in several countries on July 22, 2013, the day the song was released. It was also the same day that the music video for "Best Song Ever" premiered. Vevo announced that One Direction’s "Best Song Ever" video had 12.3 million views across Vevo in the 24 hours following its premiere. The song surpassed the previous record holder, Miley Cyrus' "We Can’t Stop," which had 10.7 million views in its first 24 hours. "Best Song Ever" will also be on One Direction's third album, whose title and release date are to be announced. Opening across the Philippines on Friday, August 30 in Digital 3D and regular theaters, “One Direction: This Is Us” is distributed by Columbia Pictures, local office of Sony Pictures Releasing International.